Me [non-chalantly]: Oh...um, that’s great! What do you think God looks like? 5-yr-old [still coloring, matter-of-factly]: He’s got long hair. Me [coming in for a closer look]: Really? 5-yr-old [big sigh, earnest concentration on long strokes with the marker]: Yeah, just like the picture of Him in our living room. 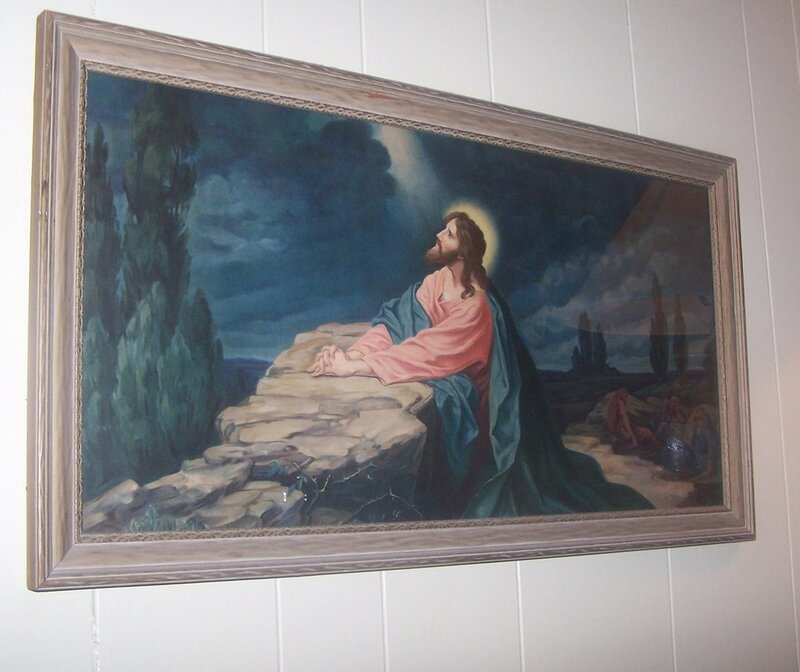 Me[wondering when we last put a picture of God up in the living room? ]: I don’t think we have any pictures of God. 5-yr-old: Yes, we do. It’s above the TV. Me[think, think! ]: Oh, that one. That’s a picture of Jesus. 5-yr-old [another sigh, as if to say, “Don’t moms understand anything?”]: Well, yes, but it’s God. Because Jesus is God. So God must have long hair. My mind is reeling, but who am I to argue with this logic? Oh, and here's the picture she's copying. Christ in Gethsemane by Heinrich Hofmann. This print used to hang in my grandpa's parsonage study. Maybe it's good that it's above our TV. Well she's got the most important part down pat. She's adorable. and I just love the simple faith of a child. It just makes sense. I love 5 year old theology!! I agree about the simple faith of a child. Oh, that we could all be that way. I love the logic too! Maybe I need to read the scriptures and believe more simplistic. I love it when they sigh like that, like they know everything and it's just so exhausting trying to teach us. You can't argue with logic like that. I have my thoughts in an email if you want to let me know where to send it. I love the "Jesus is God," statement - she gets it! isn't it great when they actually get the truths of God at such an early age! So sweet! Your family is adorable! I want to take a photo like that with mine. I think she needs to teach us all a thing or two. I love the simple faith of children. That kid has great theology! Jesus is indeed fully God and fully man despite the long hair. LOL! That picture is very similar to the one my grandma always had. I have looked around Ebay/Amazon to see if anyone had one like it. So far, that's this is the only other one I have seen that is elongated. Most (including the original I am guessing) just have the center part of that painting. Very neat to see and good story.